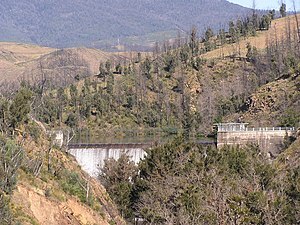 ACT Residents are being asked to pay extra money for water to pay to build the Cotter Dam. The following is a financing arrangement that will build the dam, cost the government and Actew nothing, cost the Federal government nothing, give the residents of Canberra ownership and ongoing income from the dam and be very attractive to the banks. Each resident served by the dam can be given the right to take out a zero interest loan with special conditions from any bank that wishes to offer the loans. The special conditions on the loan are that the money from the loan must purchase debentures from Actew. The money from the loans does not earn any interest. The loans must be paid back from income from the debentures which will come from higher water prices. Because the banks do not give interest on the money and because the loans must be spent purchasing Actew debentures the risk of the loans not being paid back is low and so banks do not have to take out any loans themselves to cover the assets nor do they have to keep a fraction of the loan value as liquid reserves because there will be no claim on the loan. If a person sells their debenture they must immediately repay their loan in full. Banks can charge appropriate transaction fees. Actew gets money to build the dam. There is no cost to the government and residents end up owning the dam and once the loan is repaid residents will keep the income from the debentures.